As we mentioned last month, Honda dealers all over the country are gearing up to introduce the completely-redesigned 2016 Honda Pilot, and we’re not sure what else to say about it all other than we’re really, really excited about the prospect of a new vehicle that looks as good and drives as well as this one does. 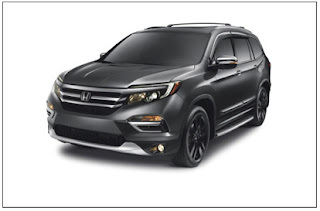 Of course, Honda is really excited about the new vehicle, as well, as there is every expectation that the new Pilot will reach new consumers looking for a larger Honda SUV than the best-selling CR-V. To help generate that buzz, the automaker has released two new advertisements to show it off. The first of them, “The Incredible Pilot Elite,” is the centerpiece of the new ad campaign, and it shows the new SUV rolling through some sort of sterile, futuristic testing warehouse, where it undergoes a ringer of weather tests, then allows a kid to let himself into the spacious third row of seats by hitting a little button on the side of the seat ahead of him. Finally, the vehicle rolls underneath a CGI rainbow as a sort of happy ending to the spot, which attempts to show the vehicle’s versatility and spaciousness. Secondly, there’s “Even Better,” a one-minute spot directed by Jason Reitman, the award-winning director of “Up in the Air” and “Juno,” which features a family road-tripping through the desert in a new Pilot singing Weezer’s “Buddy Holly” to pass the time. It’s a fun spot, and it works with the other commercial in the campaign to get people excited about the new Pilot. For us here at Pacific Honda, at least, it’s working like a charm.